Tinder Company installs and services IP based, stand alone and integrated access-security systems. The difference between Tinder Co. and other security system providers is that we specialize in both the LOCKING component AND the electronic control systems. Your access control system is only as good as the locking component. Ask us about our monitoring cost! We strive to keep our fees fair and low. And since we do not have to support corporate types that wear fancy suits, it is probably much lower than what you are paying now! We’ve spent more than thirty years building our security access control department to provide cost effective solutions to our clients. Our skilled technicians can install and repair most access control systems and security systems using industry-leading brands like INFINIAS, INTELLI-M, ALARM LOCK, IEI, KERI SYSTEMS, INGERSOLL RAND, LINEAR, AIPHONE, DOORKING, ALARM LOCK, DETEX, and many more. An access control system is only as secure as the locks that it controls. Our years of experience help us provide you with a complete system including proper lock function, door closers and latchguards so the system is secure and works like it is supposed to! Program your access schedule via your Microsoft calendar! Have your access card/fob or numeric code unlock door AND deactivate alarm! Confidently give contractor a card or code that only allows access during certain times then delete when job is done. 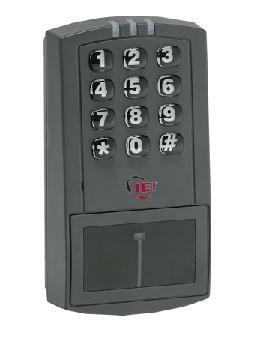 Numeric keypads are very convenient and safe. You are never locked out but you can keep the door locked and forget your keys! There are many options for security systems and access controls. We keep up to date on cutting edge technologies and with our long experience we will recommend the right product for your needs. Call or email us for a free estimate and advice.